I have had a disability since 1998, when I was in a road accident. In 2004, I founded an association for disabled persons called Attiva-Mente which works in the fields of sports, culture and solidarity. One of our most remarkable sport-related initiatives was our participation in the 2004 New York City Marathon. It was on this occasion that we heard about the Convention on the Rights of Persons with Disabilities (CRPD) for the first time, during a meeting with the Sammarinese Ambassador to the United Nations. He spoke to us about the work in progress to prepare a draft of the CRPD for presentation and acceptance by the United Nations. 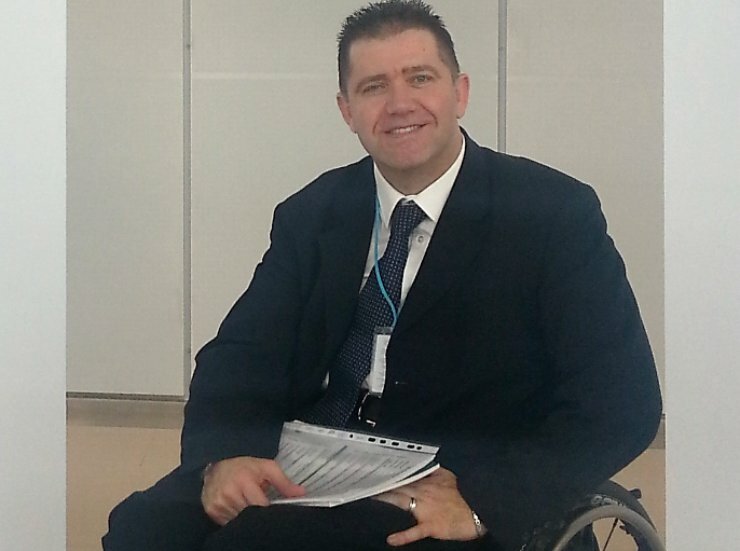 From that moment onwards, I began to advocate for acceptance and ratification of the CRPD. After returning home, I wrote many press articles about the importance of the CRPD and its developments, both on a personal level and on behalf of Attiva-Mente. In 2006, I decided to enter politics, and was elected as a Member of Parliament of the Republic of San Marino. I have since held numerous tasks in various Commissions, including the Sammarinese Commission participating in the Inter-Parliamentary Union. Between 2007 and 2008, I was Captain Regent (Head of State). One of my tasks as a Captain Regent was to chair meetings held by the Government. In a way, it was lucky, since I had the opportunity to strongly leverage the ratification of the CRPD by San Marino. Indeed, the Republic of San Marino was among the first countries to ratify the CRPD on February 22, 2008. As a politician, I have observed how the presence of a person sitting on a wheelchair in Parliament has provided a chance for many of my colleagues and citizens of my country to gain a broader understanding of issues and insights concerning disability. It was my mandate as Head of State to raise the awareness of disability issues in San Marino’s society and to break down barriers. For example, even though a law about physical access to public places for persons with disabilities has already existed for many years, it had not been fully implemented and enforced. When I become a Parliamentarian, the administration of San Marino realized I had to be able to gain access to public places both for personal and professional reasons. The Government had therefore to resolve the situation in a very short period of time, and remove the accessibility barriers for most public buildings in the old town center, as well as those in offices, theaters, churches, museums, schools and libraries. As you can see, the urgent need to accommodate a Parliamentarian was a significant motivating factor for implementing the law, more so than simply being aware of the rights of persons with disabilities. This experience highlights the importance of being present on the political scene. Article 29 of the CRPD, which establishes the right to vote and to run for the elections by persons with disabilities, is critical for stopping the invisibility of persons with disabilities and giving them a fresh start as equal citizens with equal voices as to the structure and governance of society. However, because of circumstances such as a shift in government power (my Party became a minority party from June 2009 until November 2012), economic challenges, and most especially the indifference of the majority of government leaders in my country about the CRPD, nothing had been done to implement the Convention by December 2013, more than 6 years after ratification. In December 2013, during the annual budget debate, I took the drastic step of resigning as a Parliamentarian. I explained that though I had resigned for various reasons, I mainly left because of a shameful delay in clear and coherent actions in response to the ratification of the CRPD by the Republic of San Marino. This choice was very surprising for the Sammarinese citizens, because it is highly unusual that a Parliamentarian resigns. Most often, a Parliamentarian does not leave their post, even if they are criticized or investigated. My resignation helped my Party to realize their responsibilities, and certainly helped to create a ripple effect at all levels (in the parties, in the administration, and in the public opinion) that resulted in a strong push and a collective awareness of the need to support the CRPD. As a result, the San Marino Parliament has just approved a new disability law based on the CRPD on February 23, 2015. While my story is probably not exceptional, it certainly emphasizes the importance of having persons with disabilities present at places where important decisions are made for everyone in society. The Hon. Mirko Tomassoni is a former Member of Parliament for the Republic of San Marino. He founded an association for persons with disabilities in 2004, and in 2007, he was the first person with a disability to be elected as Captain Regent of the Republic of San Marino.